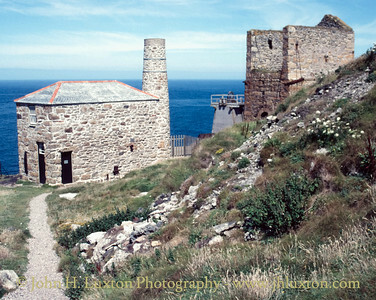 In 1820, the Levant Mining Company was formed with a capital of £400, though Levant Mine first appeared on a map in 1748. By 1836, 320 men, 44 women and 186 children were employed on the site. In Levant's first 20 years of business, £170,000 was made from mining copper. New technology was introduced to streamline production, and in 1857 a infamous man engine was installed. This engine, which comprised a moving rod, carried men many fathoms up and down the mine, to and from work each day. Many of the workings extended out under the Atlantic Ocean giving the mine the sobriquet “The Mine Under The Sea”. 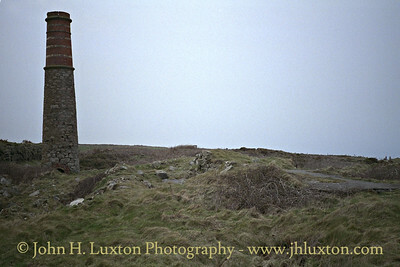 On October 29,1919 the “Man Engine” by now the last one working in Cornwall, suffered a structural failure caused by metal fatigue when the link between the engine and rod failed – this resulted in the deaths of 31 men. 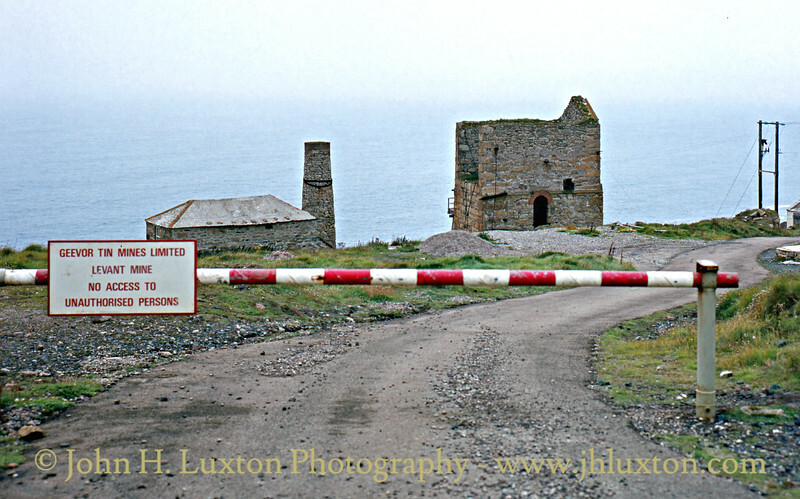 Levant Mine closed in 1930. 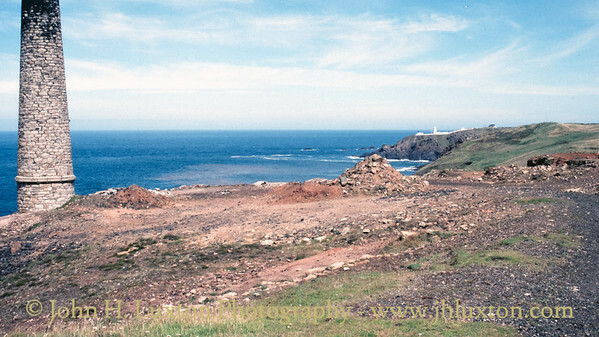 By the 1960s the adjacent Geevor Mine was seeing new reserves and began a project to pump clear the sea water which had entered the Levant mine workings following closure. This involved sealing a breach on the “Forty Backs”. This work to facilitate the reworking of Levant involved installing a new head gear, electric winder and ventilation fan at Skip Shaft. 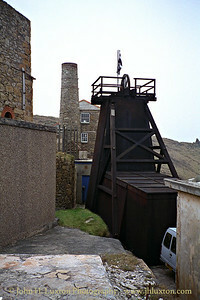 The main access to Levant was made via Geevor Mine’s Victory Shaft, however, the ventilation equipment and headgear at Levant Mine was maintained until the closure of Geevor Mine in 1990. 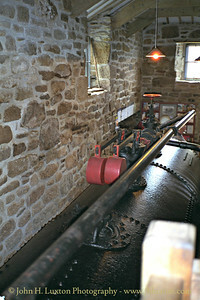 Today the buildings are in the care of the National Trust and beam winding (whim) engine is steamed on a regular basis and demonstrated to visitors. 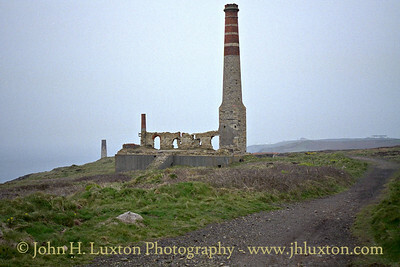 Whim and Pumping Engine Houses photographed when Levant was being operated via the adjacent Geevor Mine. The Whim engine is now preserved by the Trevithick Society and is demonstrated to the public on certain days. 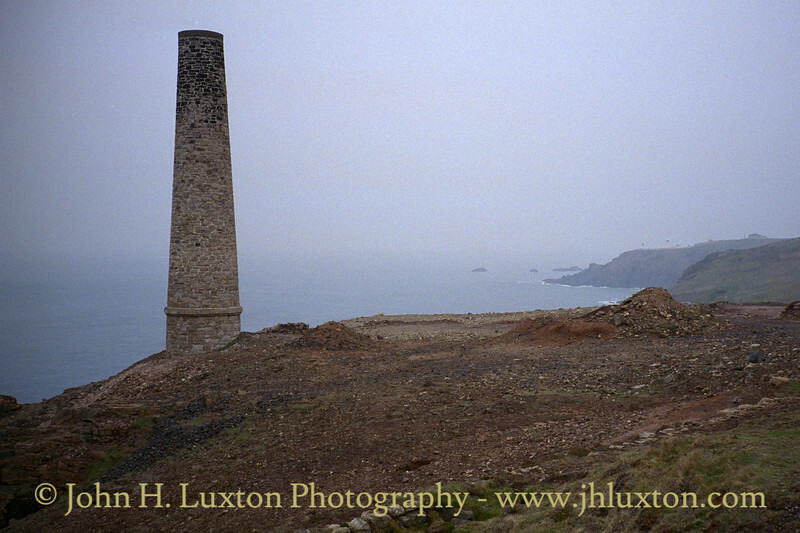 The arsenic stack after conservation work - Pendeen Lighthouse in the back ground. 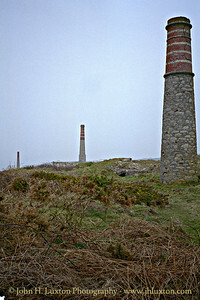 View towards Geevor Mine from the site of the Levant Arsenic works. 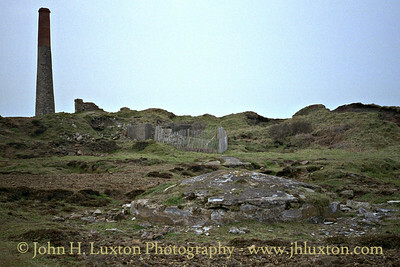 Remains of the Braunton Arsenic Calciners at Levant Mine. 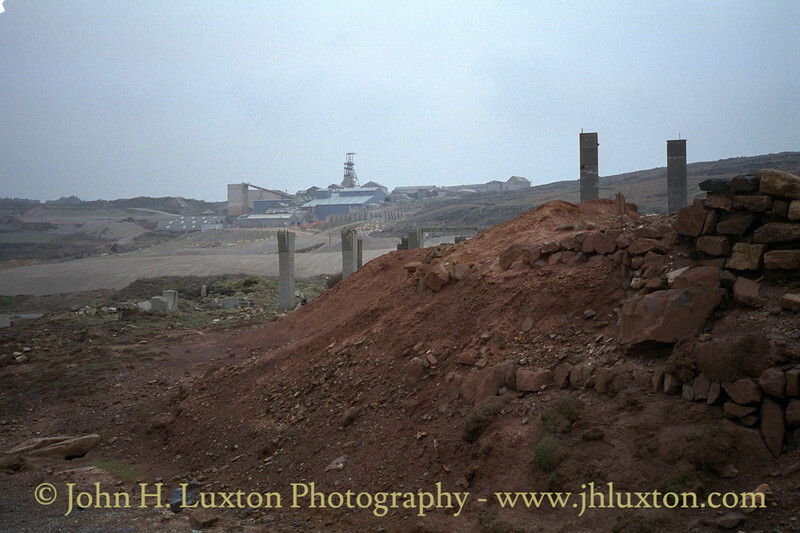 View across the mineral processing floor of Levant Mine in Trewellard Bottoms looking towards Geevor Mine. The foundations of mineral stamps can be seen - these are the large concrete plinths. The concrete has a fresh look to it despite this area having been abandoned since 1930. 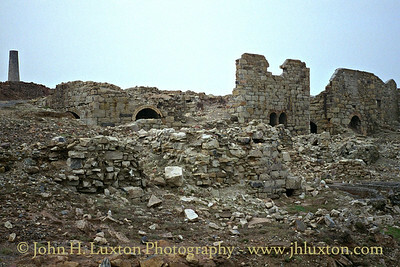 Buddle remains on the mineral processing site of Levant Mine. 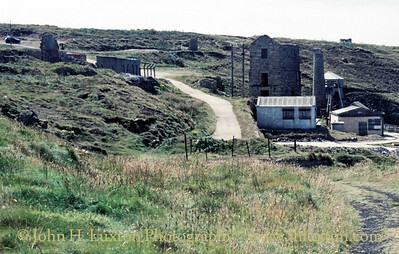 The distinctive compressor house before conservation / consolidation work had been undertaken. 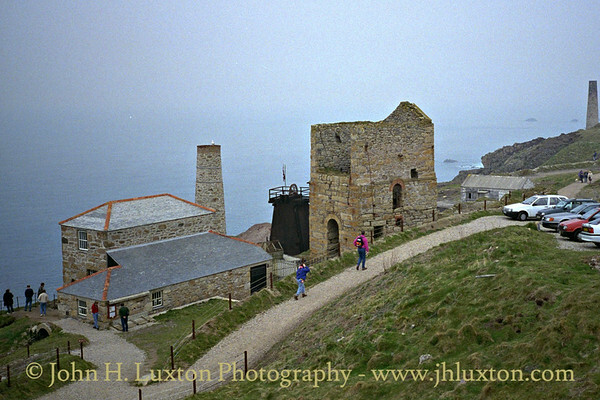 View to Levant Higher Bal from near the Man Engine Shaft. Stack of the steam engine which powered the Levant Man Engine the collapse of which caused a major disaster in October 1919. Line up of stacks - Man Engine, Compressor House and Stamp Engine House stacks. Skip Shaft Whim Engine House and Engine Shaft pumping engine house. 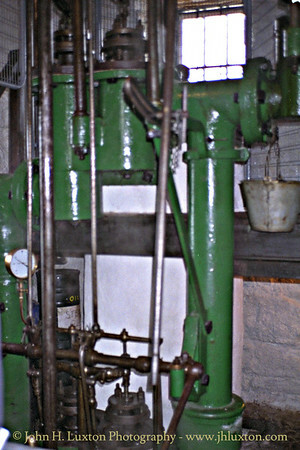 The operation of the whim engine is regularly demonstrated during the season. 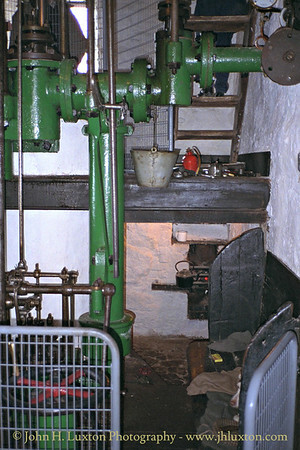 Levant Skip Shaft Whip Engine - preserved by the Trevithick Society / National Trust. 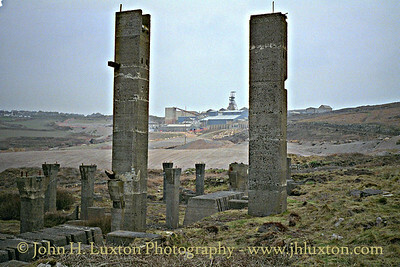 The present head gear at Skip Shaft was erected when the mine was operated by Geevor Tin Mines plc. It was only used for maintainance. 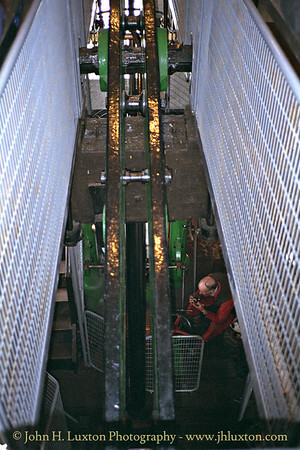 The main haulage being through Geevor's Victory Shaft. Skip Shaft whim engine house before restoration of the engine to working order. 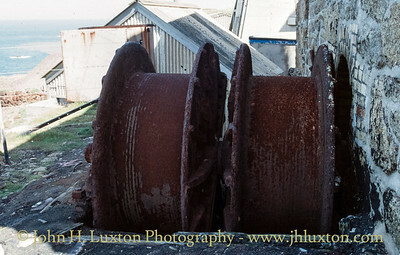 The as yet unrestored Skip Shaft whim engine winding drum. The buildings around Skip / Pumping Engine Shafts. 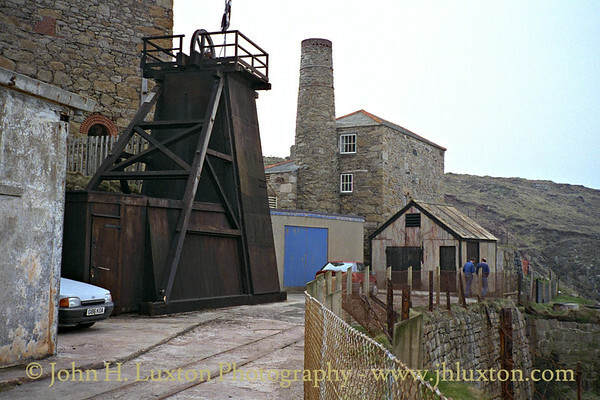 The modern buildings were constructed by Geevor Tin Mines plc in conjunction with that company's working of Levant Mine - principal access to which was via Victory Shaft at Geevor Mine. 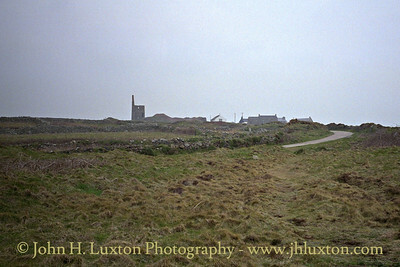 Levant Arsenic Stack - view towards Pendeen Watch. The buildings around Skip / Pumping Engine Shafts. 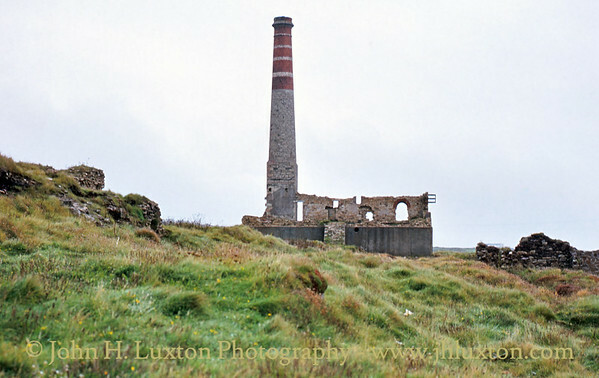 The modern buildings were constructed by Geevor Tin Mines plc in conjunction with that company's working of Levant Mine - principal access to which was via Victory Shaft at Geevor Mine. 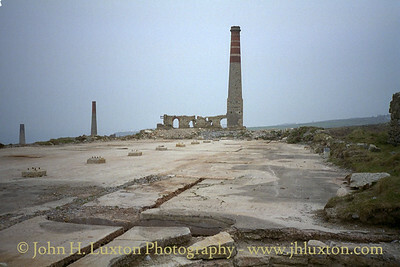 At this time a ventilation fan was in operation at Skip Shaft.